The electric cars are available 365 day a year, from 9.00 am to 01.00 pm and from 4.00 pm to 08.00 pm. From 48,00 euro (two-seater vehicles) to 53,00 euro (four seater vehicles) per day, recharge included. A recharge service takes approximately 4 hours and costs 3 euro. Rent and recharge electric cars. The electric vehicles have a range of about 100 km and, being classified as zero-emissions, are allowed to circulate in all the “Limited Traffic Zones” of Cagliari and exempted from paying the parking fee. Four electric cars are available for rent 365 days a year: 2 two-seater SMART and 2 four-seater Renault Zoe, all equipped with satellite navigation system. 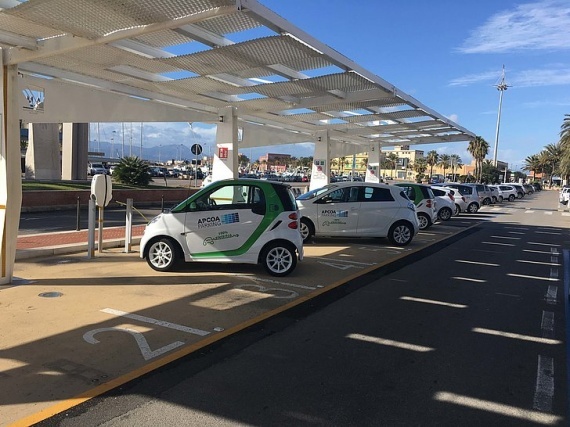 16 charging stations are situated in the Port area, 8 in Molo Ichnusa and 8 in via Roma. The recharging service requires a Key-card, provided by APCOA operators.